Discover the best tech for Christmas – in the new issue of T3 magazine! Plus, which 4K drone to buy, huge test of the first 8K TV, amazing watches for every budget, and lots more! The latest issue of T3 magazine is out now, and it's our Christmas special! Not only it does it have our huge gift guide for tech lovers, it also comes with an extra magazine that includes the best gadget gifts for under £100. 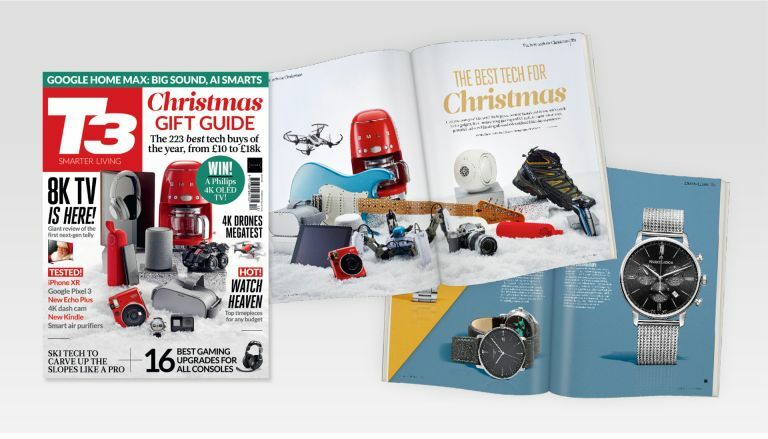 Loads of our other features and articles throughout the mag are perfect for Christmas too – from our super-test of the latest 4K drones to find out which is right for you, to our round-up of the best gaming accessories for every console and PC, to our guide to getting the perfect watch for any occasion, no matter your budget. Find out more about print subscriptions from just £9.99! Also in this issue: we review six top smart speakers, the latest ingenious skiing tech, the iPhone XR and Google Pixel 3, new Kindle and Kobo e-readers go head-to-head, and the ultimate 4K dash cam. Plus, we pick out amazing indoor training gear, we look at bar gadgets for Christmas drinks, plus the latest tech releases.